Frank Vincent DuMond was a prominent American Impressionist painter who specialized in portraits and landscapes. The Smithsonian has one drawing by Frank Vincent DuMond at the Cooper Hewitt Smithsonian Design Museum as well as his papers which are held by the Archives of American Art. His many accomplishments included his participation in several highly-respected exhibitions, including the 1893 World’s Columbian Exposition in Chicago. Many of these accomplishments were highlighted through the ephemera found in his Corcoran file. 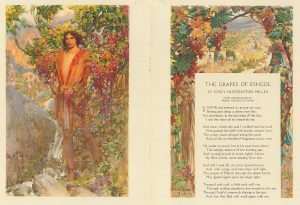 In the beginning of his artistic career, DuMond created illustrations for periodicals, a practice not uncommon amongst artists. 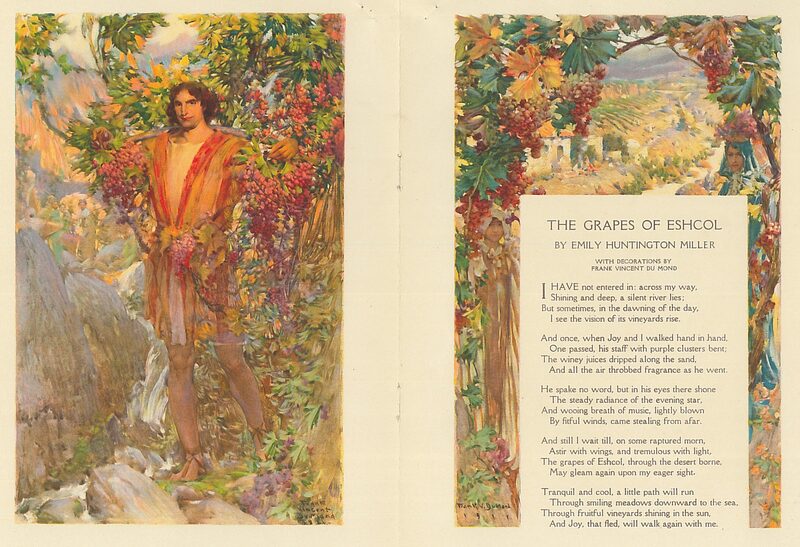 He continued these illustrations throughout his career, as can be seen in his “Two Decorative Drawings” created to accompany a poem called “The Grapes of Eschol” by Emily Huntington Miller that was in the magazine Art and Progress. The magazine emphasized that this was “one of the first serious tests made by any magazine in this country of the recently invented ‘off-set’ color printing process” that allowed colored images to be printed on rough paper instead of on glossier paper which had been the practice previously. [i] The copy from the Corcoran file is in pristine condition so the intricacies of the printed image can be seen. It is worth noting that the AA/PG Library has this issue of Art and Progress with this illustration in it. So one might ask, why have two of the same item? This serves as an example of how our ephemera files often contain materials removed from periodicals that we might already have. Storing these duplicate magazine clippings in Artist Files was a common practice for ephemera files in the days before the ease of internet research and comprehensive indexes of citations. This allowed for quicker access to information about specific artists as well as a way to preserve prior research. 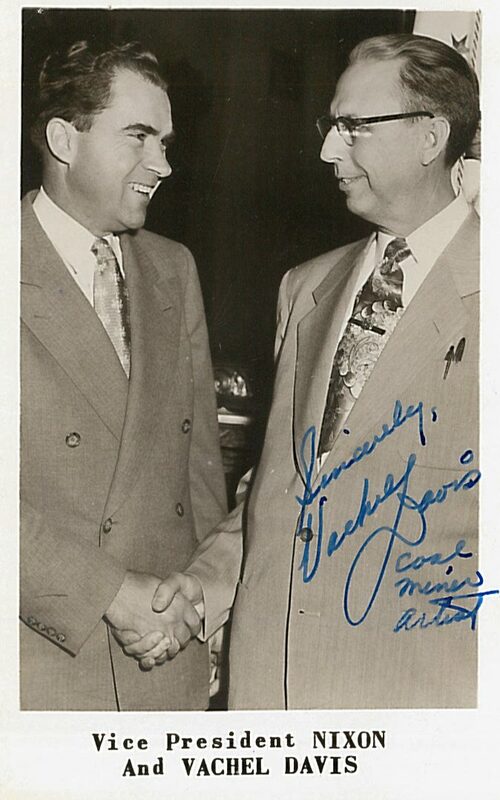 Often times the items that we find in our vertical files are materials that are sent by the artists themselves, which was the case for the materials in the Vachel Davis file. 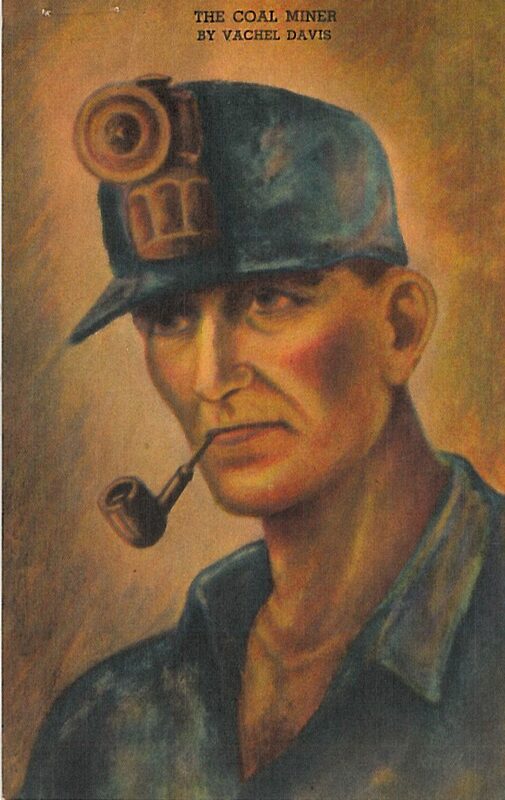 Davis was born in 1898 in Eldorado, Illinois, a town that had a significant coal mining economy. Davis himself was a miner for 14 years, but left the field because he felt that mining conditions were far too dangerous. 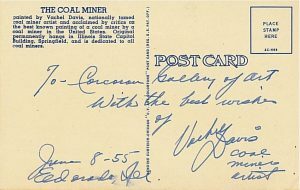 He began a new career path as a journalist which may have spurred him to voice his concerns for the welfare of all miners. The items in Davis’s file came to the Corcoran from Vachel himself. 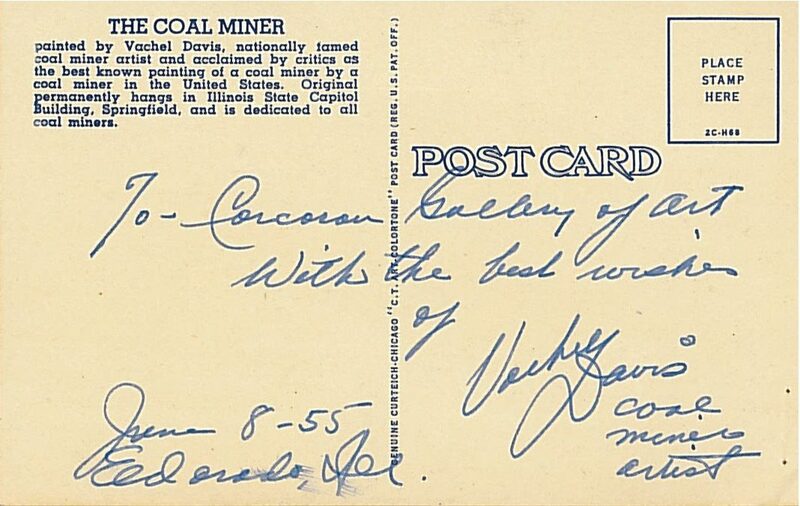 The items included a signed photo of him and Richard Nixon, a postcard featuring his famous “Coal Miner” painting with a note from Davis, and a newspaper article from a local newspaper lauding his role in changing coal mining conditions and subsequent successes. Artists often send items to curators and museums in order to bring attention to their work in hopes that the museum may acquire it or exhibit it. Luckily these personalized promotional type materials are often kept in order for future reference and for further research.